Published: Jan. 26, 2014 at 07:20 p.m. Updated: Jan. 27, 2014 at 03:21 p.m.
JERSEY CITY, N.J. -- Peyton Manning's boss had the NFL's greatest ever sign-off. John Elway won back-to-back rings with the Denver Broncos -- then walked away. In his first press conference of Super Bowl week, Manning was asked if it has ever entered his mind that he could be playing his last NFL game next Sunday against the Seattle Seahawks. It's a question Manning will surely get more than once in the next week, but his answer Sunday made it pretty clear the 37-year-old quarterback isn't ready to step away from a game he's come to master. His career -- now 16 years deep -- is viewed on a "one-year-at-a-time" basis. "I really had no plans beyond this game," Manning said aboard the docked Cornucopia Majesty (really). "I had no plans coming into the season beyond this year. I think that's the healthy way to approach your career at this stage." As Manning continued, he made his intentions more clear. "I still enjoy playing football. I feel a little better than I thought I would at this point coming off that surgery. I still enjoy the preparation part of it, that work part of it. 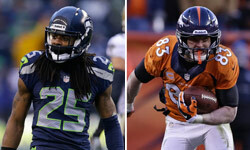 "Everybody enjoys the games, everybody's going to be excited about the Super Bowl. But I think when you still enjoy the preparation, the work part of it, I think you probably still aught to be doing that. I think as soon as I stop enjoying it, and I can't produce, and I can't help the team, that's when I'll stop playing. If that's next year, maybe it is, but I certainly want to keep playing." Manning said he spoke with both Elway and Ray Lewis (who also went out with a ring) about the timing of retirement. Manning believes his situation is different. "They couldn't play anymore," he said. "That was all they had to give. They truly left it all out there." It's fairly apparent that the only thing that could shut Manning down after a record-setting season is bad news from a doctor. Manning has repeatedly said he feels good physically, so don't count on that happening. 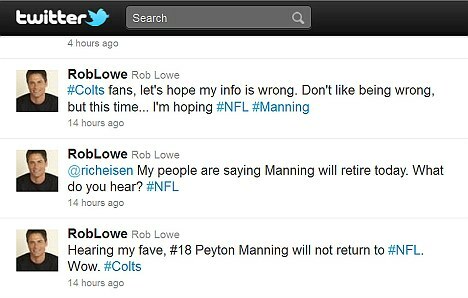 Rob Lowe is still wrong.